Hubby and Canyon were able to try out their new matching swim shorts from Tom and Teddy this past weekend at a swimming party. Their beach wear collection for Men and Boys is unique and classy! My boys were very pleased with quality of the shorts. They felt like soft, worn in cotton. They were sturdy for the water, yet dried very quickly. 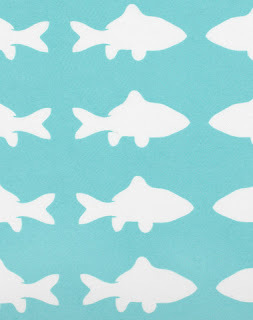 We chose the Blue and White Fish line in mens and boys. Hubby loved that there were side pockets as well as a pocket in back with velcro. Often times swim shorts don't have pockets, but for Dad's it is a must. They also have a drawstring to cinch up the waist which was helpful. The boys size did run a bit large but we easily cinched up the waist. These are premium quality swim shorts that will last for years! When Canyon was on the water slide waiting in line the lifeguard looked out to the diving board and asked Canyon if that was his dad; she had noticed their matching shorts! She mentioned to Canyon that she really liked his swim shorts. That is great coming from a lifeguard who seems hundreds of different swim shorts in a season! Eye catching but not overly crazy, the Tom and Teddy line have solid colors as well as great ocean prints like salmon, octopus, penguins, turtles and more. Still plenty of heat this summer left to enjoy with Tom and Teddy matching swim shorts! Check out Tom and Teddy online for your next pair. Pockets are always a plus! It seems like we need them in everything. Love this idea - boys like to dress like their dads. They often get a kick out of having the same things. Great that a company is coming up with cute and comfortable products for both.